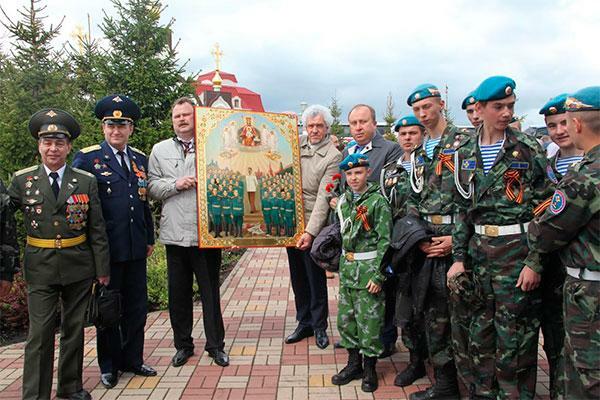 Representatives of the Belgorod Archdiocese of the Russian Orthodox Church have issued a statement denouncing a painting created in the style of an Orthodox icon featuring Joseph Stalin and Soviet WW2 generals. Earlier this week, people gathered at Prokhorovka field, the site of a key WW2 battle in Russia’s Belgorod region, to hold a ceremony dedicated to the fallen, featuring the painting, entitled ‘Sovereign Holy Mother’, which shows Stalin and his marshals on Red Square under the gaze of Mary, the mother of Christ. The painting was carried and transported by vehicles through the site of the battle, passing churches and monuments; a monk priest named Athonogenes prayed for the fallen heroes. The Battle of Prokhorovka was one of the largest armored clashes in history, and part of the larger Battle of Kursk of July-August 1943, which broke the Nazi offensive and gave Soviet forces the strategic initiative for the rest of the war. 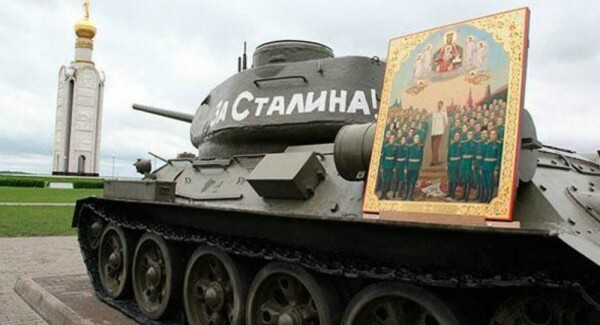 This is not the first time in post-Soviet Russian history that lone religious figures and believers have attempted to fuse images of Stalin with those of Orthodox Christianity. A scandal blew up in St. Petersburg in 2008 surround a painting entitled ‘Matron and Stalin’, featuring the controversial leader’s alleged wartime meeting with the Blessed Eldress of Moscow, a canonized 20th century Orthodox Saint. 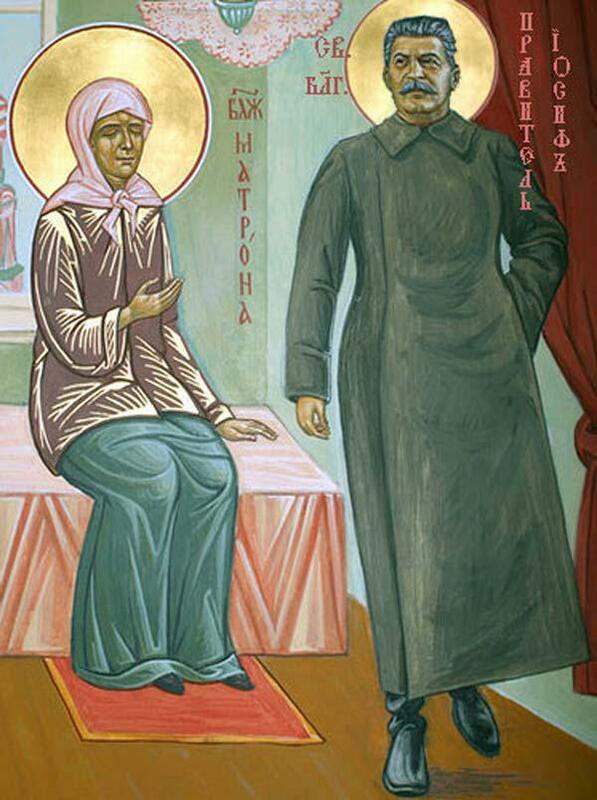 The ‘icon’s’ presence in a local church led to the dismissal of the priest who had hung it up, despite the priests’ protestations that Stalin was a man of faith. Stalin’s relations with the Russian Orthodox Church were complicated. On the one hand, the leader was responsible for the terrible persecution and near-destruction of the Church as a social entity during the 1930s, with tens of thousands of priests, monks and nuns dismissed, imprisoned or killed, and many churches shut down, destroyed or converted into museums and warehouses. On the other hand, relations with the Church improved dramatically during the Second World War, when it was revived as a patriotic organization, a relationship which continued until Nikita Khrushchev launched another wave of persecution, this time less brutal.